We are yaying and swaying because the season to kick off our heels and jump in front of the TV is finally here! This is how our Christmas break is going down: A bag of popcorn, a warm blanket, and a new series. And we have picked something to watch that is perfectly devious and undoubtedly brilliant. *Drumrolls* The new show on Amazon Prime Video, The Marvelous Mrs Maisel. The period drama has got TWO Golden Globe nominations - Rachel Brosnahan for the Best TV Comedy Actress and the show for the Best TV Comedy Series - but there’s more to recommend the show, we have found out. Go through the list of reasons that make The Marvelous Mrs Maisel our pick of the season and once you start watching it, we’re sure you’ll add your own, too. 1. Girl Power All The Way! The hero of the show is a woman, and we dig that! Her journey from a housewife to a stand-up comedian is pebbled with unintentionally hilarious scenes, but we really love is that Mrs Maisel is her brave (sometimes vain) self. And it’s not just the character on camera who’s a champion but also the woman behind it: the show is written, directed and exec produced by Sherman-Palladino (the brains behind Gilmore Girls). Everyone knows the cure to being hurt is a glass (or a few bottles) of wine and a night in. We feel you, Mrs Maisel. The scene where she enters a comedy club drunk, dressed only in a nightie and a skimpy robe and unabashedly starts talking into a microphone about her woes could have been painful, but it’s funny as hell! Sorry, Midge. This is just the beginning, but we won’t give you any more spoilers! The show takes us to 1950’s New York and the vintage setting has all the feels. It’s easy to time travel to the Upper West Side with the show’s elaborate period sets and fab costumes. Even the cycles parked on the streets are aesthetically pleasing and we want to go back to the era when gentlemen wore hats everywhere! Despite the decades between us, the outfits are just timeless. Midge’s closet are full of turtle-necks, slim fit high waist pants and a lot of gorgeous vintage coats. And did you see that perm on her? Why do we love this woman? Because 60 years ago, she ignored her father’s advice to study something ‘practical’ at university and went on to secure a degree in Russian Literature. 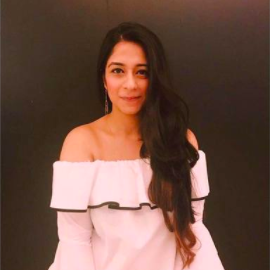 She even gave herself a toast at her own wedding, breaking all norms. And, the foray into comedy has been just as unconventional, especially for that time. Take a bow, Mrs Maisel, because you inspire us. So here is to strong women, may we be them, may we raise them and certainly may we watch more of them. 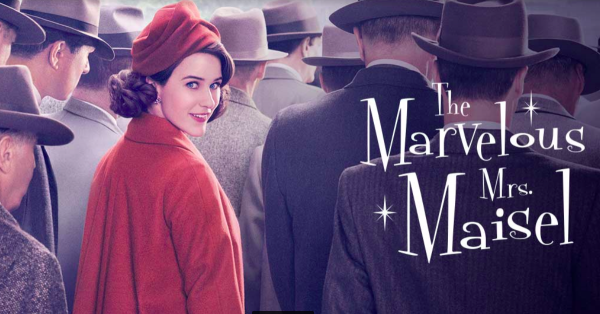 So jump right into bed, bundle up and start binge-watching The Marvelous Mrs Maisel on Amazon Prime Video here already. *This post is in collaboration with APV.